I am so excited to share a great company, a great story, and great specialty chocolate confections with you today! You can definitely start some New Easter Traditions by adding specialty chocolates from Confections for Any Occasions to every Easter basket or gift for all your loved ones! They will definitely LOVE You for it! You will make Easter morning memorable for chocolate-lovers of all ages with baskets full of handmade chocolate bunnies, old-fashioned whipped crème eggs or chocolate eggs decorated in pastel colors. Hop to a higher level in gourmet taste, authenticity and freshness this Easter with artisan chocolates by Confections for Any Occasion. 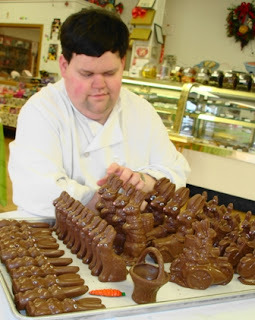 Young, blind entrepreneur, Joel Bernhard makes customized chocolates that will enrich your Easter celebrations. His one-of-a-kind gourmet chocolates are made with the finest Swiss-style chocolate, locally sourced ingredients and premium dairy products. 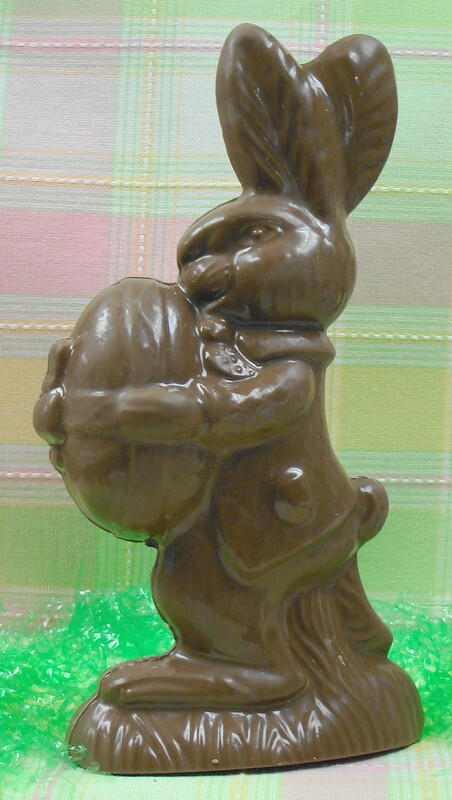 For Easter, choose from the largest selection of 30 plus 3-D chocolate bunnies from 1 ounce to 5 pound bunnies made of luscious chocolate in hard to find, white chocolate, dark chocolate and popular favorite, milk chocolate. Find chocolate bunnies of all shapes and sizes that are standing, sitting, riding in cars, on a motorcycle or a tractor. A solid 3 pound chocolate bunny holding an egg makes for the perfect Easter centerpiece that’s edible, too. Other specialty novelties include decorative Easter baskets, lambs, crosses, and chocolate coconut and rice krispy nests with jellybean eggs. Easter Chocolate lollipops shaped into bunnies, chicks hatching, roosters and Easter eggs are hand painted with pastel colors for the season. For a twist on traditional peeps — Confections’ has taken this marshmallow treat to a new level with chocolate dipped bunnies and chick-shaped peeps. These fun candies are perfect for all the special peeps in your life. Create the ultimate chocolate experience by filling a solid chocolate Easter basket with Confections’ meltaways—crème eggs filled with raspberry, peanut butter or maple nut, and real whipped crème eggs. You’ll also find sugar free confections, chocolates and jelly beans along with a wide assortment of authentic Jelly Belly jellybeans now available in spring-time flavors. 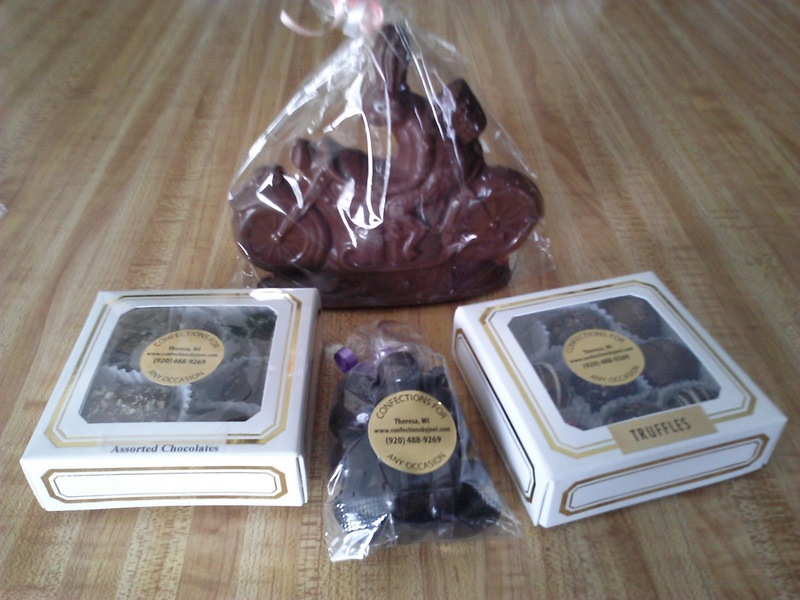 I received a great selection of some of their tastiest chocolate confections including the Chocolate Bunny Riding a Motorcycle, Assorted Truffles, Chocolate Covered Almonds and other assorted Chocolates! Not only do I love Confections for Any Occasion because they are based in the great state of Wisconsin (where I lived for the last four years!) but their chocolates are A-MAZING! Seriously, some of the best I have ever had! And I love how unique the Chocolate Bunnies are! My husband LOVED this Motorcycle-riding Bunny - perfect as a gift for him for Easter! And I must admit...the other chocolates were ALL a gift for myself! I did NOT want to share these amazing chocolate treats! The truffles were to die for and the salted caramels were melt-in-my-mouth deliciousness!!! Buy It: You can purchase all chocolate confections online with convenient shipping to one’s door by visiting www.confectionsbyjoel.com.